Since the beginning of the nuclear age, the United States has played a leadership role in global nuclear nonproliferation and disarmament diplomacy to help advance U.S. and international security. Since the beginning of the nuclear age, the United States has played a leadership role in global nuclear nonproliferation and disarmament diplomacy to help advance U.S. and international security. Past presidents have actively led efforts to reduce the number and role of nuclear weapons leading to their eventual elimination, a key obligation undertaken by all states under the nuclear Nonproliferation Treaty (NPT). For decades, U.S. presidents have pursued arms control agreements under difficult circumstances, often when relations with foreign adversaries were at their worst. Dwight Eisenhower pursued a nuclear test ban treaty with the Soviets, and John Kennedy concluded the Limited Test Ban Treaty. Under Lyndon Johnson, the United States led the way on the negotiation of the NPT and initiated strategic arms talks with the Soviets, which opened the way for Richard Nixon, Gerald Ford, and Jimmy Carter to conclude strategic arms limitation treaties. Ronald Reagan, under strong public pressure to freeze the arms race, negotiated agreements with the Soviets to ban intermediate-range missiles and verifiably reduce strategic nuclear arsenals. George H.W. Bush took bold steps to withdraw tactical nuclear weapons during the tumultuous final days of the Soviet Union. Bill Clinton’s administration convinced three former Soviet republics to give up their nuclear weapons, pushed for the Comprehensive Test Ban Treaty (CTBT), secured the indefinite extension of the NPT, and negotiated a freeze on North Korea’s nuclear program. Even George W. Bush accelerated the pace of U.S. strategic arms reductions under an agreement with Russia. Barack Obama prioritized the negotiation and ratification of the New Strategic Arms Reduction Treaty (New START) and, despite worsening relations with Russia, put enormous effort into the negotiation of the complex deal to curtail and contain Iran’s nuclear program. Now, citing a “threatening security environment,” the administration of Donald Trump is effectively abandoning the United States' traditional global leadership role on nuclear arms control. At the same time, it is accelerating costly plans to rebuild the oversized U.S. nuclear arsenal, pushing to develop and deploy new nuclear capabilities, and expanding the range of circumstances in which the United States might consider using nuclear weapons. Trump’s passive and aggressive attitude on nuclear matters is fraught with peril. History shows that nuclear risk reduction and proliferation prevention does not just magically happen. It requires persistent, creative, and energetic U.S.-led diplomacy and engagement with adversaries. But the Trump administration’s newly completed Nuclear Posture Review (NPR) does not offer any new nuclear risk reduction initiatives. Instead, the report meekly states that “the United States will remain receptive to future arms control negotiations if conditions permit.” The report does reiterate U.S. support for the nonproliferation elements of the NPT, but omits any mention of the U.S. disarmament commitments under Article VI of the treaty. Nevertheless, U.S. diplomats gamely claim that Trump “remains firmly committed to nonproliferation” and will continue to abide by the NPT commitments. The NPR report does not even commit to the extension of New START, which will expire in three years. If the treaty is allowed to lapse in 2021 with nothing to replace it, there will be no limits on U.S. and Russian strategic nuclear forces for the first time since 1972. At a time when U.S.-Russian relations are strained, New START is even more vital for strategic stability and risk reduction. The NPR report also declares, without any explanation, that the United States will not seek ratification of the CTBT, a treaty the United States and 182 other states have signed that has not entered into force. Worse still, the Trump administration is actively undermining the global nuclear nonproliferation regime by threatening to pull out of the Iran nuclear deal if the other parties do not agree to extend indefinitely the current limits on Iran’s nuclear capacity. The better approach is to fully implement the agreement and seek opportunities to build on its nonproliferation value. Responsible nations do not ignore their legal and political commitments on nuclear arms control, nonproliferation, and disarmament. They cannot afford to undercut effective treaties and miss opportunities to reduce and eliminate nuclear risk, especially now. This applies to U.S. dealings with North Korea, which has finally indicated it is open to direct talks with Washington. This also applies to Russia, which is violating the 1987 Intermediate-Range Nuclear Forces Treaty. Absent U.S. leadership, other states and the United Nations will need to put forward creative approaches to bring about a cessation of the arms race, draw all nuclear-armed nations into the disarmament enterprise, and reduce the nuclear danger. Why the new Nuclear Posture Review doesn’t make the country safer. The new NPR comes with a high price tag. That is not the only issue. The Trump administration’s Nuclear Posture Review (NPR) is consistent in many respects with long-standing nuclear policies. Yet, certain elements are deeply troubling. In terms of consistency, it reiterates that the primary mission of U.S. nuclear weapons is to deter nuclear attack; rejects a declaratory no-first-use policy; retains the long-standing policy of ambiguity as to what constitutes U.S. vital interests, although with less ambiguity; seeks to assure allies; and reinforces the U.S commitment to the nuclear Nonproliferation Treaty (NPT). These are pillars of U.S. deterrence policy. The choices that are troubling include the intention to seek a new low-yield nuclear capability, the rejection of future arms control agreements, and the plan to increase U.S. nuclear weapons production capability. These matters, in particular, deserve close scrutiny by Congress and public debate. The report on the 2010 NPR concluded that “the threat of global nuclear war has become remote, but the risk of nuclear attack has increased.” This conclusion remains valid. The underlying assumption in the 2018 NPR, however, is that the risk of nuclear attack, although not quantified, has increased, that it is the greatest risk facing the United States, and that the country’s deterrent is not sufficiently robust to counter or deter the increased risk. Alternatively, even if the risk has not increased, the latest NPR report seemingly calls into question whether the U.S. deterrent is sufficiently robust to deter the same level of risk. Thus, the new report concludes that U.S. nuclear forces must be “supplemented” now. To that end, it calls for the nuclear complex to be positioned to develop new nuclear weapons, possibly resume explosive nuclear testing, increase the size and makeup of the nuclear stockpile, and increase the diversity of the delivery systems. The report argues that without expanding the capabilities of the nuclear enterprise, particularly the ability of the National Nuclear Security Administration (NNSA) to move beyond its current focus on life-extension programs for warheads, this and future administrations will not be able to tailor deterrence to the changing nature of potential adversaries. In contrast, the prior NPR report determined that the greatest risks were presented by terrorists with weapons of mass destruction, particularly nuclear or radiological capabilities, and the proliferation of nuclear weapons capabilities to states such as North Korea. Based on this conclusion, significant emphasis was placed on addressing these proliferation and terrorism threats, including securing, consolidating, and eliminating highly enriched uranium (HEU) and plutonium that could be used by terrorists in an improvised nuclear device. Although there is no indication that these threats have diminished, they are not given priority in the 2018 NPR report. One can only hope that the language urging funding trade-offs among programs does not include the programs that prevent proliferation and ensure the security of weapons-usable materials. Realistically, however, the 2010 review also recognized that nuclear deterrence alone was not the answer but rather that a wide spectrum of highly capable U.S. conventional capabilities, including missile defense, in conjunction with nuclear forces would provide the best deterrent for the United States and its allies and partners. In a bold step, the 2010 NPR report tried to identify and set the conditions for meaningful compliance with the disarmament provision in NPT Article VI, while clearly recognizing that the conditions were not currently suited to achieve those goals and might not be for many years. Since 2010, unfortunately, the global security conditions have become even less conducive to achieving a world without nuclear weapons. The 2010 report, while aspiring to these goals, reflected a growing concern that the world was approaching a nuclear tipping point where more states and more weapons would be the norm. Although the nuclear deal with Iran has removed that country’s nuclear weapons capability for the time being, North Korea’s nuclear weapons capability has qualitatively and quantitatively improved, China and Russia have embarked on nuclear weapons modernization programs, and the nuclear arsenals of India and Pakistan have grown. Russia, China, and even North Korea are expanding their conventional and nuclear programs to match or offset the U.S. conventional force advantage. The United States has been very public about Russian deployment of a new nuclear-capable missile system in violation of the landmark 1987 Intermediate-Range Nuclear Forces (INF) Treaty.2 China has continued its assertiveness in the Asia-Pacific region, growing and diversifying its conventional capabilities and modernizing its nuclear forces. While remaining small in number, their nuclear forces are becoming increasingly more capable and survivable. These disturbing trends are unlikely to change in the near term. Although focused and driven primarily by Russian behavior, China’s growing conventional capabilities, including space and cyber capabilities, also shape the decisions in the 2018 report. In addition to the near-term decision to “supplement” the nuclear forces with a low-yield variant of the W76-1 warhead for ballistic missile submarines, the new report lays out a long-term plan to prepare the United States to develop, test, and deploy new nuclear weapons and to increase the size of the nuclear stockpile. In short, prepare for a new arms race. This new version of a hedging strategy—being able to address geopolitical and technical uncertainty, a key tenant of the 2010 and previous reports—includes a decision to retain more weapons longer and make new weapons faster. The United States can hedge in two complementary ways. One is by having a robust nuclear weapon production infrastructure that has the design, engineering, and manufacturing capabilities needed to quickly produce new or additional weapons needed to address changes in the threat environment. Another approach is to retain a significant non-deployed inventory of weapons that can be added to current delivery vehicles to address geopolitical threat or technical failure. One disturbing aspect of the new approach is the apparent decision to keep the last megaton weapon in the U.S. arsenal, the B83. How long this warhead will be retained is unclear, but one section of the NPR report indicates that it will be retained until replaced. On the other hand, the report continues previous decisions to maintain the nuclear triad and replace the delivery systems: a new Columbia-class ballistic missile submarine, a new intercontinental ballistic missile, a new long-range bomber, and a new air-launched cruise missile. A new addition to the ongoing programs is a sea-launched cruise missile (SLCM). Whether the SLCM goes forward is highly dependent on Russia and whether it continues to violate the INF Treaty or returns to compliance. The new low-yield warhead, although designed to counter Russia’s growing arsenal of novel nonstrategic systems, may prove to be counterproductive. To deploy the new low-yield warhead, the United States, unlike Russia, will sacrifice some of its strategic warheads because nonstrategic nuclear warheads are not counted under the 2010 New Strategic Arms Reduction Treaty (New START). Russia has taken advantage of this fact by substantially increasing its arsenal of nonstrategic weapons, while complying with the limitations on strategic systems. Because the Trident II D5 ballistic missile on U.S. ballistic missile submarines and any warheads on it are counted under New START, the low-yield warhead will be subject to the treaty limits, just like the higher-yield W76-1. In other words, it is a one-for-one trade-off. How many low-yield weapons will be produced is unknown, but having fewer high-yield warheads, such as the W76-1, seems to advantage Russia. A concept of operations has yet to be explained for the new low-yield weapon. The sea leg of the nuclear triad is the most survivable leg in large part due to the ability of Ohio-class submarines to be invisible in the open ocean. Launching a high-value D5 missile from a ballistic missile submarine will most likely give away its location. China and Russia are expanding their ability to detect a missile launch and will be able to locate a U.S. submarine if it launches a D5 missile. Is having a low-yield warhead worth the risk of exposing the location of a ballistic missile submarine at sea? Whether there is the political and budgetary will to implement the 2018 NPR report remains to be seen. The biggest challenge laid out in the 2018 report is the new assignment for the NNSA. The NNSA is well into the process of fixing its aging infrastructure, but has a long way to go. It cannot fund these very expensive, one-of-a-kind nuclear facilities within its existing budget plan. A new state-of-the-art HEU storage facility is complete, and the design of the new uranium processing facility is well along. The NNSA is deciding where to build a new plutonium facility, but needs new funding, and the 1976-era PF-4 plutonium facility at the Los Alamos National Laboratory must be replaced at some point. Continuing resolutions in Congress and changing requirements add to the cost and delay schedules. The NNSA does not have out-year funding to implement the next generation of stockpile stewardship, build new experimental facilities, conduct and diagnose more subcritical experiments at the Nevada National Security Site, expand computational capabilities necessary to maintain the current stockpile, identify and resolve future problems, conduct life extension programs, and support the fight against nuclear terrorism and proliferation. New capabilities such as the stockpile responsiveness program and other new efforts to challenge the design and manufacturing skills of the nuclear complex will also need new funding. As the 2018 NPR report points out, although there is a new tritium-extraction facility at the Savannah River Site in South Carolina, the NNSA needs a new tritium loading facility. Lithium facilities must be constructed or a commercial source identified. In the long term, enrichment capabilities must be built to provide suitable low-enriched uranium fuel to produce tritium. If indeed the 2018 NPR is setting the NNSA on a course to build more weapons and new weapons, the NNSA budget must increase significantly. Not mentioned at all in the NPR report is the cost, which could run into the low billions, to safely tear down the old buildings, such as building 9212 at the Y-12 National Security Complex at Oak Ridge, Tennessee, as the new buildings become operational. Transporting nuclear weapons, materials, and parts is also a mission not mentioned. Because funding for the new secure trailers for the Secure Transportation Asset program4 has been delayed, the new trailers will not be available until 2024, and the program is understaffed. The fiscal year 2019 budget that President Donald Trump sent to Congress in February calls for $11 billion for NNSA weapons activities. That would be an increase of about $800 million, or 8 percent, from the fiscal year 2018 request and $1.8 billion more, a 20 percent jump, from the enacted funding for fiscal year 2017. It is not clear how much of those budget requests will be enacted by Congress, nor is it clear necessary increases will be sustained under future administrations. Historically, neither Congress, the Department of Defense, nor the Office of Management and Budget have shown an inclination to fully fund the NNSA program of record, let alone the new initiatives such as those outlined in the 2018 NPR report. Even though the NNSA budget has increased by 60 percent since 2010, the efforts to address the decades of inattention to the infrastructure have not been fully funded. Similarly, stockpile surveillance work and the extremely successful Stockpile Stewardship Program have been cut back to support the ongoing warhead life extension programs. The NNSA’s challenge is further complicated by an inability, imposed by Congress, to hire the skilled federal workforce needed to design and oversee implementation of the existing programs. Even though the NNSA’s work has grown significantly over the past five years, Congress continues to impose an arbitrary cap on federal staff at 1,690 employees. The labs, plants, and the NNSA will need to recruit and train new staff and retain new and existing staff to carry out the life extension programs, maintain a robust Stockpile Stewardship Program, and take on the many new initiatives. Staffing efforts, including for the Secure Transportation Asset program, is further hindered by the year-long security clearance process, and the backlog is growing. Although the 2018 NPR report puts considerable emphasis on the relatively low cost of nuclear deterrence in the overall defense budget, the NNSA’s entire budget already supports the spectrum of deterrence. There are no trade-offs and no untapped sources of funding. A significant omission in the NPR report is how the NNSA will get the new funding. History has taught us that having the Defense Department move its money to the NNSA is not the answer. That approach, although well meaning, led to dissent and discord in the Defense Department-NNSA relationship. Only an increase in the overall defense budget, which includes the Defense Department and NNSA, can support the full range of efforts. Even the new low-yield weapon will be expensive, despite assertions in the NPR report that it will be easy, fast, and cheap. The Defense Department must not neglect its efforts to maintain its nuclear enterprise and the existing delivery systems until the new platforms are fielded. This effort, started under Secretary of Defense Chuck Hagel, is essential to the long-term well-being of the nuclear enterprise. The well-documented loss of focus on all things nuclear starting with Operation Desert Storm forced the military services to devote resources, attention, and a renewed commitment to sustain the nuclear deterrent and the men and women who support it. The 2018 NPR report also expresses strong support for upgrading the nuclear command, control, communications, and early-warning system known as NC3.5 Here again, efforts to revitalize the system have been underway for years, such as new secured protected communications and early-warning satellites, but funding is always a challenge, particularly for the related terminals and ground systems. New START meets these criteria. Extending New START, whose central limits were achieved on February 5 by Russia and the United States, would further support these goals. Russia has not shown any interest in a new treaty, but it did leave open the door for discussion to extend New START by five years, an option provided in the treaty. Discussions beginning this summer or fall to extend New START would go a long way toward demonstrating that arms control remains important. Does the Trump administration NPR put an end to the decades-long reduction of the role of nuclear weapons in U.S. national security and military strategy? Does it position the United States for a new nuclear arms race and a return to nuclear weapons testing after a 26-year moratorium? Is there the political and budgetary will to implement this new, more aggressive nuclear force posture and policy and its supporting infrastructure? Does the NPR report present an appropriate approach given an increasingly uncertain and competitive world? These questions need to be addressed as the administration’s newly released fiscal year 2019 budget request is considered by Congress. 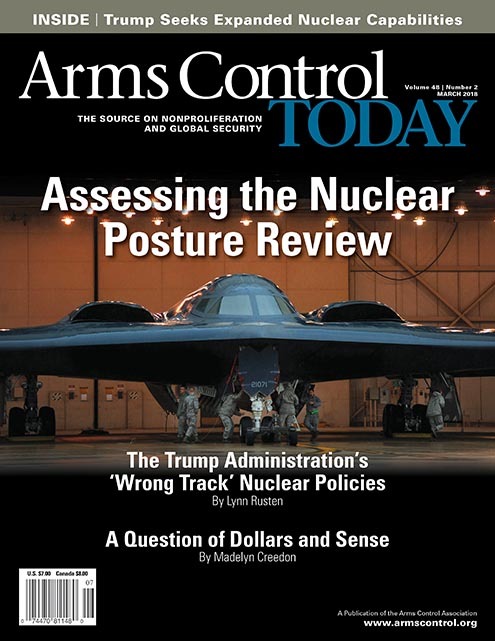 1 Office of the Secretary of Defense, “Nuclear Posture Review,” February 2018, https://media.defense.gov/2018/Feb/02/2001872886/-1/-1/1/2018-NUCLEAR-POSTURE-REVIEW-FINAL-REPORT.PDF; U.S. Department of Defense, “Nuclear Posture Review Report,” April 2010, https://www.defense.gov/Portals/1/features/defenseReviews/NPR/2010_Nuclear_Posture_Review_Report.pdf. 2 Michael R. Gordon, “Russia Has Deployed Missile Barred by Treaty, U.S. General Tells Congress,” The New York Times, March 8, 2017. 3 “National Security Strategy of the United States of America,” December 2017, https://www.whitehouse.gov/wp-content/uploads/2017/12/NSS-Final-12-18-2017-0905.pdf. 4 Office of Secure Transportation, National Nuclear Security Administration, “Ten-Year Site Plan FY2012 Through FY2021,” April 2011, https://nnsa.energy.gov/sites/default/files/nnsa/inlinefiles/OST%20TYSP%202012-2021%20053111%20cjs.pdf. 5 U.S. Government Accountability Office, “Nuclear Command, Control, and Communications: Update on Air Force Oversight Effort and Selected Acquisition Programs,” GAO-17-641R, August 15, 2017. Madelyn Creedon was the Department of Energy’s principal deputy administrator for the National Nuclear Security Administration from 2014 to 2017 and was assistant secretary of defense for global strategic affairs from 2011 to 2014. More action is needed to avert the next nuclear proliferation crisis. If one had to choose the most exceptional year in the history of the International Atomic Energy Agency (IAEA) safeguards regime, it would be 2003. That year saw four events that, it is clear after 15 years, represented important challenges and in some respects missed opportunities for the governments seeking to prevent the spread of nuclear weapons. On January 10, 2003, North Korea announced its withdrawal from the nuclear Nonproliferation Treaty (NPT), a unique case so far. On February 21, IAEA inspectors discovered at Natanz in Iran a pilot centrifuge enrichment facility ready to start operation, as well as the existence of undeclared nuclear material. On March 20, U.S. forces invaded Iraq on the pretext that the country still had a weapons of mass destruction program that included nuclear weapons. On December 19, Colonel Moammar Gaddafi announced that Libya was abandoning its 20-year covert nuclear weapons program; and as a result, the IAEA discovered the existence of a vast international network of clandestine nuclear traffic headed by Abdul Qadeer Khan of Pakistan. Incidentally, it was also the year during which, after some 15 years of an IAEA budget policy of zero real growth, the agency’s Board of Governors agreed to increase the regular budget of the safeguards department by 22 percent (in real terms) over a period of four years. Still, the international community failed to take bold steps similar to what it had done a dozen years earlier. At that time, following the 1991 Persian Gulf War, the world discovered that Iraq had developed a clandestine nuclear weapons program over an extended period of time in parallel to its declared peaceful nuclear activities. This was despite the fact that Iraq was a party to the NPT and had had a comprehensive safeguards agreement in force with the IAEA since 1972. Realizing that a comprehensive safeguards agreement1 did not provide the IAEA with the necessary tools to verify the declarations of non-nuclear-weapon states, the IAEA board in 1997 approved the Model Additional Protocol to provide the tools to draw the so-called broader conclusion that there are no undeclared nuclear material and activities in a non-nuclear-weapon state and that its declarations are correct and complete. It is disturbing that no comparable measures were adopted after the 2003 events. The following analysis will focus on Iran’s noncompliance with its IAEA safeguards agreement, North Korea’s withdrawal from the NPT, and the lessons not yet fully learned. Three major lessons from the experience with Iran relate to dealing with a state found in noncompliance with its safeguards agreement. Lesson 1: In a case of noncompliance, the IAEA must refer it to the UN Security Council without undue delay. In November 2002, IAEA Director-General Mohamed ElBaradei said, “I believe that while differing circumstances may necessitate asymmetric responses, in the case of noncompliance with nonproliferation obligations, for the credibility of the regime, the approach in all cases should be one and the same: zero tolerance.” Yet, by failing to declare Iran in noncompliance in the IAEA director-general’s November 2003 report and in the ensuing Board of Governors resolution, the IAEA created a damaging precedent with far-reaching consequences still felt today. When noncompliance is detected by the safeguards department, time is of the essence in reporting it. Any noncompliant state should know that it will be referred within a short period of time first to the IAEA board and then to the UN Security Council. If it proactively cooperates to correct the situation, it should be referred to the council for “information purposes only,” as was the case with Libya in March 2004. If the state in noncompliance adopts a “policy of concealment, with cooperation being limited and reactive, and information being slow in coming, changing and contradictory,”2 as was the case in Iran, the issue should be reported without delay to the council for action. The problem with such a resolution, which the board might well adopt in a future case of noncompliance, is that it is not legally binding. The only way to make it legally binding is to have it adopted by the Security Council. In the case of Iran, a binding resolution was not adopted by the council until December 2006.3 Three crucial years were lost, making the situation practically irreversible. Last year marked the 60th anniversary of this forward-looking mandate coming into force. In practice, unfortunately, the commitments accepted by non-nuclear-weapon states under a comprehensive safeguards agreement and even an additional protocol to their safeguards agreement are much more limited, particularly as relates to access to information, persons, locations, and data and documents.4 Iran is well aware of those limitations. These broader access rights, conducted under “managed access” conditions, must not exclude military sites because it is likely that the military or related actors would be involved in nuclear activities associated with a weapons program, should one exist.6 Denial of, unwarranted delays in, or limitations to access should be reported by the IAEA director-general to the board and, as appropriate, to the Security Council. Lesson 3: The UN Security Council should adopt a generic resolution preventively dealing with cases of noncompliance. This generic resolution should also require the noncompliant state to (1) immediately suspend all nuclear fuel-cycle-related activities as long as the IAEA has not been able to draw the broader conclusion and (2) conclude with the agency, within a limited period of time, a facility-specific safeguards agreement for all its nuclear facilities. The latter requirement is necessary to close the most damaging safeguards agreement loophole detailed below in Lesson 6. This generic resolution should provide that if the IAEA director-general is unable to report within 60 days of the adoption of the corresponding state-specific resolution that the noncompliant state has concluded the required facility-specific safeguards agreement or that it is fully implementing the other requirement of the resolution, the Security Council would immediately convene to adopt a new Article 41 resolution sanctioning the noncompliant state. The level of sanctions would not be predetermined, and the permanent members of the Security Council would still have a veto right, but it would make the adoption of sanctions at an early stage much more likely and therefore constitute an improved deterrence. One should bear in mind that, for almost 10 years, the Security Council’s legally binding sanctions against Iran were very limited and essentially targeted designated individuals and entities involved in nuclear or ballistic missile activities. These limited sanctions did not stop Iran from continuing to make progress on its nuclear program in contravention of legally binding Security Council resolutions. At the time of the November 2003 report, Iran had no operating uranium hexafluoride-conversion plant and no operating centrifuge plant at Natanz, and the construction of a heavy-water research reactor at Arak had not yet started. By early 2006, when the IAEA finally reported Iran’s noncompliance to the Security Council, the situation was very different, and there was no way Iran could be compelled to return to the status of its nuclear program at the time of the November 2003 IAEA report. This fact is reflected in the Joint Comprehensive Plan of Action concluded in July 2015 between Iran and China, France, Germany, Russia, the United Kingdom, and the United States, which allows Iran to continue enriching uranium under a range of restrictions. The nuclear agreement’s main objective is to ensure that Iran is constrained and monitored for 15 years so that it cannot break out and manufacture a nuclear weapon in less than one year.9 As long as all parties meet their obligations, this objective will be attained. Some of the constraints accepted by Iran represent a remarkable and largely unexpected achievement. Yet, this is really not a long period for Iran; it will soon be 15 years since the IAEA visited Natanz for the first time. There is little doubt that around 2030, if not before, Iran will be a nuclear threshold state, that is, a state capable of manufacturing more than one nuclear weapon in a period of a few months and having the necessary delivery means. With that in mind, while the nuclear deal’s negotiations were underway, in March 2014 this author recommended privately to high-ranking officials at the U.S. Department of State the inclusion of two provisions. The first was a requirement that Iran place each of its nuclear facilities under an IAEA facility-specific safeguards agreement. The second was a requirement for Iran to ratify the Comprehensive Test Ban Treaty (CTBT), as requested in June 2010 under Security Council Resolution 1929. Unfortunately, neither was included in the nuclear deal. It is difficult to understand on what basis Iran could have objected to these two requirements since Supreme Leader Ayatollah Ali Khamenei had issued a fatwa stating that the production, stockpiling, and use of nuclear weapons is forbidden under Islam, and the agreement’s preamble states that “Iran reaffirms that under no circumstances will Iran ever seek, develop or acquire any nuclear weapons.” France, Germany, Russia, and the UK have ratified the CTBT. So it is most likely that the United States, because it has not yet done so, did not push for inclusion. There are three further lessons to be drawn from the safeguards experience in North Korea. Lesson 4: In case a nation withdraws from the NPT, the UN Security Council must act promptly and decisively to condemn the action and impose sanctions. Shortly after North Korea submitted its initial report to the IAEA in May 1992 under its safeguards agreement, inconsistencies emerged between its initial declaration and agency findings, centering on a mismatch between declared plutonium production and solutions containing nuclear waste. On April 1, 1993, the IAEA board declared that North Korea was in noncompliance with its safeguards agreement and promptly reported the case to the UN Security Council. In the meantime, North Korea had declared on March 12, 1993, its intention to withdraw from the NPT. The Security Council in May 1993 adopted Resolution 825, calling on North Korea to reconsider its withdrawal. Since then, North Korea has repeatedly been declared by the IAEA to be in noncompliance with its safeguards agreement. The Agreed Framework concluded between the United States and North Korea in October 1994 resulted in the latter suspending its NPT withdrawal and agreeing to freeze the operation of a number of sensitive facilities. Unfortunately, because of the imprecise formulation of the framework, North Korea subsequently did not agree to some IAEA verification measures, such as the taking of samples and nondestructive analysis measurements. The North Koreans also did not submit accounting reports to the agency for the facilities covered by the freeze. For a period of 13 years after North Korea was first reported to the Security Council for noncompliance, the council failed to adopt a single resolution condemning Pyongyang, even during the three and a half years that followed its NPT withdrawal. Only after the North Koreans tested a nuclear weapon on October 9, 2006, did the council five days later take legally binding action for the first time by adopting Resolution 1718, which imposed an embargo on arms and luxury goods, an asset freeze, and a travel ban for persons designated as involved in the nuclear program. Further, it imposed a ban on a range of imports and exports and prohibited Pyongyang from conducting nuclear tests or launching ballistic missiles. These sanctions were much too mild and came much too late to dissuade North Korea from continuing with its nuclear weapons program. Since then, North Korea accelerated testing of nuclear weapons and launched increasingly more capable ballistic missiles. The main factor leading to this serious situation is China’s consistent opposition, until 2017, to effective Security Council sanctions against Pyongyang. China’s stated justification was concern that harsh sanctions could precipitate the collapse of the regime, potentially driving hundreds of thousands of North Korean refugees into China and increasing the likelihood of Korean unification under the leadership of the democratic South. China would then have a border with a U.S. ally that is home to more than 25,000 U.S. troops. Although China’s concerns are legitimate, the consequence of its unconstructive and ineffective attitude until very recently is that North Korea today has an arsenal of nuclear weapons, which it is unlikely to abandon in the foreseeable future. In any case, it is critical for the Security Council to adopt new measures to minimize the risk that other states could one day follow North Korea’s example. Lesson 5: The Security Council needs to deter withdrawal from the NPT by making the use of the veto right less likely. As exemplified by the cases of Iran and North Korea, one of the greatest difficulties in deterring states from violating their nonproliferation undertakings and from ignoring legally binding Security Council resolutions is the hope that at least one of the five veto-wielding council members will oppose the adoption of effective sanctions. As a step toward strengthening the nonproliferation regime, the Security Council should adopt a generic and legally binding resolution deciding that if a state notifies its withdrawal from the NPT (an undisputed right under Article X.1), such notification constitutes a threat to international peace and security as defined under Article 39 of the UN Charter.10 This generic resolution should make sure that the Security Council would meet immediately with a view to decide, under Article 41 of the UN Charter, which measures would apply as soon as the withdrawal becomes effective. This generic resolution should include a statement by the council’s five permanent members that they consider the withdrawal to be such a major threat to international peace and security that, in such a case, they do not intend to exercise their veto right against any state-specific sanctions resolution if they are the only permanent member to do so. Because this declaration of intention is not legally binding, that generic resolution would not deprive those members of their veto right on any state-specific resolution. It would ensure that the council consider the matter without delay and increase the risk of immediate sanctions for the withdrawing state. Lesson 6: All nuclear fuel-cycle facilities should be subject to irreversible IAEA safeguards. One of the main outstanding safeguards loopholes that deserves prompt attention is the absence of a requirement for IAEA safeguards to irreversibly remain in force should a state leave the NPT. If one day Iran or any other NPT non-nuclear-weapon state decides to withdraw, its safeguards agreement with the IAEA would automatically lapse under the terms of that agreement. As a result, a state may withdraw from the NPT and use previously safeguarded nuclear materials and facilities to produce nuclear weapons without violating any international treaty. NPT members therefore should strengthen safeguards rules and practices by creating a legal requirement to maintain safeguards even if a state exercises its right to withdraw from the NPT. Over the past 15 years, states and organizations have submitted proposals designed to close this significant loophole. For example, Luxembourg submitted a working paper on behalf of the European Union to the 2005 NPT Review Conference recommending that states “[a]ffirm as a matter of principle that all nuclear materials, equipment, technologies and facilities, developed for peaceful purposes, of a State Party to the Treaty on the Non-Proliferation of Nuclear Weapons remain, in case of a withdrawal from the Treaty, restricted to peaceful uses only and as a consequence have to remain subject to safeguards.”11 Germany and France made similar proposals in 2004. The UN Security Council attempted to address this issue in 2009, passing Resolution 1887, which urges states to “[r]equire as a condition of nuclear exports that the recipient State agree that, in the event that it should terminate its IAEA safeguards agreement, safeguards shall continue with respect to any nuclear material and equipment provided prior to such termination, as well as any special nuclear material produced through the use of such material or equipment.” However, this resolution does not extend to domestically produced nuclear material, equipment, and facilities. Moreover, because it was not adopted under Chapter VII of the UN Charter, it is not legally binding. None of these proposals have created an effective legal barrier to a state’s utilization of previously safeguarded facilities and materials for military purposes after its withdrawal from the NPT. It seems unrealistic to expect, as the Nuclear Suppliers Group (NSG) does, that a country deciding to leave the NPT and expel IAEA inspectors would agree thereafter to enter into a facility-specific safeguards agreement with the IAEA, return previously delivered material and equipment to the supplier state, or accept inspectors from the exporting state to conduct verification work that IAEA inspectors are no longer allowed to do. As this author recommended in March 2015,12 it would be much more effective to require states to conclude a facility-specific safeguards agreement with the IAEA before any materials or technology are transferred, rather than as a bilateral and limited fallback obligation after a state has withdrawn from the NPT, as foreseen by the NSG. Indeed, in contrast to comprehensive safeguards agreements, facility-specific safeguards agreements, known as INFCIRC/66-type agreements, do not lapse if the state withdraws from the NPT. NSG members should formally agree to interpret their “effective safeguards in perpetuity” export criterion13 as requiring the recipient state to have an INFCIRC/66-type safeguards agreement in force with the IAEA before enrichment- or reprocessing-related equipment, technology, or expertise is transferred. NSG non-nuclear-weapon states should lead by example and place all their enrichment and reprocessing facilities under facility-specific safeguards agreements with the IAEA. For non-nuclear-weapon states, INFCIRC/66-type safeguards agreements concluded with the IAEA are and would continue to be subsumed under existing comprehensive safeguards agreements. They would become operational only if the latter were terminated. This approach does not create a new safeguards standard, as the Model Additional Protocol did in 1997. Instead, it involves the simple adoption of an older type of safeguards. Therefore, it should face fewer political obstacles, would impose no operational financial burden on the state or the IAEA, and would require only a little extra paperwork at the outset. By virtue of the current roster of NSG members, if this approach could be achieved, nearly all non-nuclear-weapon states that are parties to the NPT and currently operate enrichment and reprocessing facilities would have endorsed this new mechanism. The only exception would be Iran. Nuclear-weapon states should also lead by example when it comes to their own facilities. Currently, nuclear-weapon states have a voluntary offer agreement with the IAEA, under which they determine which facilities they will make available for safeguards. The nuclear-weapon states provide the IAEA with a list of these “eligible” facilities. In order to demonstrate commitment to the principle of irreversible safeguards, each nuclear-weapon state should agree to place any enrichment or reprocessing facility on its list under INFCIRC/66-type safeguards agreements. In such a case, enrichment facilities in China, France, the UK, and the United States, as well as French and UK reprocessing plants, would be subject to irreversible IAEA safeguards. With negotiations on a fissile material cutoff treaty stalled, this would provide an alternative means of achieving a first step toward a similar goal and may enable the nuclear-weapon states to demonstrate some concrete progress in this area. To this end, members of the Security Council should discuss and agree on legally binding generic procedures for responding to noncompliance and NPT withdrawal. Because council members would not know which states might be involved in the future, such discussions should be easier and less acrimonious than they would be during the heat of a crisis. An agreement on a set of standard responses to be applied evenhandedly, regardless of the noncompliant state’s allies, would significantly enhance the credibility of the nonproliferation regime. If adopted, the measures recommended in this paper would make a real difference in protecting against nuclear proliferation. Yet, all countries, most of all the five permanent members of the Security Council, will need to acknowledge that these measures should be adopted now in order to mitigate the consequences of the next proliferation crisis. 1 Under a comprehensive safeguards agreement, the IAEA has the right and obligation to ensure that safeguards are applied on all nuclear material in the territory, jurisdiction or control of the State for the exclusive purpose of verifying that such material is not diverted to nuclear weapons or other nuclear explosive devices. 2 International Atomic Energy Agency (IAEA) Board of Governors, “Implementation of the NPT Safeguards Agreement in the Islamic Republic of Iran,” GOV/2003/75, November 10, 2003, para. 50. 3 UN Security Council, S/RES/1737, December 27, 2006. It was only after finding Iran in possession of a document on the production of uranium metal hemispheres, a process related to the fabrication of nuclear weapons components, and after Iran resumed enrichment activities in January 2006 that the IAEA Board of Governors adopted a resolution on February 4, 2006, deciding to report the Iranian file to the UN Security Council. IAEA Board of Governors, “Implementation of the NPT Safeguards Agreement in the Islamic Republic of Iran,” GOV/2006/14, February 4, 2006. 4 For a detailed analysis of these additional protocol limitations and the way they should be temporarily corrected when a state found to be in noncompliance is not fully and proactively cooperating with the IAEA, see Pierre Goldschmidt, “IAEA Safeguards: Dealing Preventively With Non-Compliance,” Carnegie Endowment for International Peace, July 12, 2008, http://carnegieendowment.org/files/Goldschmidt_Dealing_Preventively_7-12-08.pdf. 5 IAEA Board of Governors, “Implementation of the NPT Safeguards Agreement in the Islamic Republic of Iran: Report by the Director-General,” GOV/2005/67, September 2, 2005, para. 50. 6 “The IAEA’s existing authorities should be interpreted to give the Agency the responsibility to inspect for indicators of nuclear weaponization activities.” IAEA Board of Governors and IAEA General Conference, “Report of the Commission of Eminent Persons on the Future of the Agency: Note by the Director General,” GOV/2008/22-GC(52)/INF/4, May 23, 2008 (containing an annex titled “Reinforcing the Global Nuclear Order for Peace and Prosperity: The Role of the IAEA to 2020 and Beyond,” p. 19). 7 Other generic resolutions are UN Security Council Resolution 1373 concerning acts of international terrorism and Resolution 1540 concerning the acquisition of nuclear, chemical, or biological weapons and their means of delivery by nonstate actors. 8 Pierre Goldschmidt, “Concrete Steps to Improve the Nonproliferation Regime,” Carnegie Papers, No. 100 (April 2009), pp. 29-41. 9 The nuclear agreement with Iran includes transparency measures extending beyond 15 years, such as a long-term IAEA presence in Iran, IAEA monitoring of uranium ore concentrate produced by Iran from all uranium ore concentrate plants for 25 years, and containment and surveillance of centrifuge rotors and bellows for 20 years. 10 In Resolution 1540 (2004), the Security Council is “[a]ffirming that proliferation of nuclear, chemical and biological weapons, as well as their means of delivery, constitutes a threat to international peace and security.” It has reaffirmed that statement many times thereafter, but has never “decided” that this is the case under an operative paragraph of a legally binding Chapter VII resolution. 12 Pierre Goldschmidt, “Securing Irreversible IAEA Safeguards to Close the Next NPT Loophole,” Arms Control Today, March 2015. 13 Nuclear Suppliers Group, “Guidelines for Nuclear Transfers,” NSG Part 1, June 2013, para. 6(a)(iv). 14 “Much of the sensitive information coming from the [Abdul Qadeer Khan] network existed in electronic form, enabling easier use and dissemination. This includes information that relates to uranium centrifuge enrichment and, more disturbing, information that relates to nuclear weapon design.” IAEA Board of Governors, “Implementation of the NPT Safeguards Agreement in the Socialist People’s Libyan Arab Jamahiriya,” GOV/2008/39, September 12, 2008, para. 38. 15 Nicholas Miller and Vipin Narang, “How North Korea Shocked the Nuclear Experts,” Politico, August 26, 2017, https://www.politico.com/magazine/story/2017/08/26/north-korea-nuclear-tests-shock-experts-215533. Pierre Goldschmidt is a former nonresident senior associate at the Carnegie Endowment for International Peace. He was deputy director-general and head of the Department of Safeguards at the International Atomic Energy Agency from May 1999 to June 2005. This paper is based on the author's presentation at a November 2017 conference held by the Wilson Center and the Los Alamos National Laboratory. In the classic 1964 film Dr. Strangelove, the Russian ambassador revealed that his country’s “Doomsday Machine,” if triggered by an attack on Russia, would destroy all human and animal life on earth. Today, the same can be said about the U.S. nuclear war plans, policies, and forces to carry them out, says Daniel Ellsberg in his new book, The Doomsday Machine: Confessions of a Nuclear War Planner. The book starts off with divulging a secret. In addition to the 7,000 pages Ellsberg copied that became the Pentagon Papers, there was an equal or greater number of pages that he planned to release devoted to nuclear war planning, the command and control of nuclear weapons and nuclear crises, his other areas of expertise. These pages unfortunately were lost through an odd series of events, and Ellsberg laments that he did not make known what he had copied. The book revisits these issues, and he calls on those who have access to similar information today to reveal the policies and plans that may assist in reversing course in all nuclear-weapon states. After graduating from Harvard University, Ellsberg spent three years in the Marine Corps, some of the time in South Vietnam. He joined Rand in 1959 as an analyst and traveled widely, mainly to the Pacific. His discoveries alarmed him. He found that, in defiance of treaties, nuclear weapons were stored in Japan. Further, he found that the so-called nuclear football that follows the president’s every step was essentially a hoax to keep up the pretense that only the president can initiate nuclear war. In fact, there was widespread predelegation at the time of authority to military commanders, meaning there were many fingers on the nuclear launch button. “Whatever the publ ic declarations to the contrary, there has to be delegation of authority and capability to launch retaliatory strikes, not only to officials outside the Oval Office but outside Washington too, or there would be no real basis for nuclear deterrence,” he writes. A life-changing moment came in the spring of 1961 when Ellsberg saw a graph that had been prepared by the Joint Chiefs of Staff to answer the question of how many fatalities would result if the United States carried out a first strike on the Soviet Union. After he followed up with more questions, the answer was approximately 600 million. From that day, Ellsberg writes, his overriding life purpose has been to prevent the execution of any such plan. Nevertheless, the arms race took off with the Soviet Union. Its Doomsday Machine interacted with its U.S. counterpart, creating a dangerous situation that continues to this day. A major culprit on the U.S. side was the growing number of targets. With intelligence from U-2 overflights and then reconnaissance satellites, the target list grew to astounding proportions, in the tens of thousands. With more targets designated, the “need” for nuclear weapons to hit them grew.2 Other factors were interservice rivalry, design lab competition, technological improvements, and the money and jobs that flowed to lawmakers’ home states and districts, all justified by an expansive definition of deterrence. The U.S. nuclear weapons stockpile reached a peak of more than 31,000 in 1967. Ellsberg was an observer or a participant in many key milestones of the Cold War. From Rand, he joined the Department of Defense and was instrumental in helping to draft and implement the first nuclear war plan, known as the Single Integrated Operational Plan.3 He had the highest clearances and briefed Pentagon officials, the Joint Chiefs of Staff, and the president’s assistants. He witnessed the handling of the Berlin crisis and Cuban missile crisis. His revelations about them make the book and the footnotes, which show familiarity with the latest scholarship, a valuable addition to the historical record.4 A true history of the Cuban missile crisis, he concludes, shows that the existence of many nuclear weapons, even in the hands of leaders who are about as responsible, humane, and cautious as we have seen, still poses a danger to the survival of civilization. As a measure of what nuclear weapons might do if used, Ellsberg often cites nuclear winter, a condition that would eventually destroy all human and animal life on the planet. Although reduced in number from the swollen arsenals of the mid-1980s, when the phenomenon was first described, there remain enough nuclear weapons to cause such an environmental cataclysm, as Ellsberg reminds us several times. There is an interesting chapter devoted to the early thoughts and calculations during the Manhattan Project about the chances of a nuclear explosion igniting the atmosphere. Ellsberg notes there was genuine uncertainty at the time. It was stated that there was a “negligible” chance, a remote possibility, but not a zero chance. That they proceeded, he concludes, is an example of the gamble taken by intelligent and rational men in the name of national security. Similar logic applies today by those gamblers who devise war plans that have the potential to kill hundreds of millions of people. It is often said that nuclear weapons have not been used since August 1945. Ellsberg asserts that this is false. In fact, they are used repeatedly in the form of threats. He lists more than two dozen crises in which such threats were made overtly or covertly or when discussions about potential nuclear weapons use occurred. These are the known instances for which there is a documentary record. How many others have there been that we do not know about, and what about other nuclear nations, he wonders. Ellsberg offers a few policy prescriptions, including advocacy of a no-first-use nuclear policy and further measures to reduce the hair-trigger status of nuclear forces, which could lead to accidental or ill-considered use. To a sizable degree, Ellsberg pins his hopes for change on public education with a belief that Americans, if they knew the true situation, would be outraged and bring change. Yet, although there are many proposals to change the current dangerous situation,5 the Trump administration’s newly issued Nuclear Posture Review moves policy in ways antithetical to Ellsberg’s views. Ellsberg looks back with misgivings and wonders how he did the things he did to help create a Doomsday Machine. Indeed, years after those early fears of the Manhattan Project bomb makers about the potential consequences of nuclear detonation, Ellsberg recounts his own brush with those prepared to engage with the fundamental forces of nature in the name of security. Ellsberg recalls that, as a Rand analyst, he was tasked to evaluate a proposal from the U.S. Air Force known as Project Retro. The problem at hand was ensuring that a Soviet first-strike intercontinental ballistic missile attack on U.S. missile silos would not destroy the capability to launch a retaliatory missile strike. The apparently serious idea was to assemble 1,000 first-stage Atlas rocket engines and affix them in the opposite position to the rotation of the earth. Under attack, the United States would ignite the engines simultaneously in an effort to momentarily stop the earth’s rotation, thereby causing the Soviet missiles to miss their targets. Today, Ellsberg asks, how much crazier is this idea than the overall situation created throughout the nuclear era? As with the Pentagon Papers, Ellsberg has performed a public service in writing a candid book that states where we are more than seven decades into the nuclear era. This book provides abundant evidence that describes our nuclear predicament and how we got here, as well as ideas and insights that may help extricate us from the potentially devastating path we now walk. 1 Gerald E. Miller, “Beres and Others Have No Access to the ‘True Strategy,’” Center Magazine, November/December 1982. Miller wrote at length on the factors that led to a large U.S. stockpile. Jerry Miller, Stockpile: The Story Behind 10,000 Strategic Nuclear Weapons (Annapolis, MD: Naval Institute Press, 2010). 2 Admiral Stansfield Turner discovered that the Single Integrated Operational Plan called for a railroad bridge spanning a river in Bulgaria to be hit with a nuclear weapon. Stansfield Turner, Caging the Nuclear Genie: An American Challenge for Global Security (Boulder, CO: Westview Press, 1997), p. 8. 3 The “single” plan has turned into a “family of plans” with a name change. The nuclear war plan of the United States is now called OPLAN 8010. For details, see Hans M. Kristensen, Robert S. Norris, and Ivan Oelrich, “From Counterforce to Minimal Deterrence: A New Nuclear Policy on the Path Toward Eliminating Nuclear Weapons,” FAS Occasional Paper, No. 7 (April 2009). 4 Ellsberg has a website that supplements the book and on which he posted some of the lost documents. There are also notes and memos from his files and material gained through the Freedom of Information Act. For more, see http://www.ellsberg.net/. 5 Kristensen, Norris, and Oelrich, “From Counterforce to Minimal Deterrence”; Bruce Blair, “Strengthening Checks on Presidential Nuclear Launch Authority,” Arms Control Today, January-February 2018. Robert S. Norris is a senior fellow with the Federation of American Scientists and author of Racing for the Bomb: General Leslie R. Groves, the Manhattan Project’s Indispensable Man (2002). Arms control treaties and nonproliferation agreements are mechanisms that nuclear-weapon states and non-nuclear-weapon states alike rely on to help provide transparency, predictability, and stability for regional and global security. In the last year, several elements of this key architecture have come under fire. U.S.-Russian nuclear arms control is a key element because both countries together still possess about 95 percent of the world's nuclear weapons. Without bilateral progress, there is little incentive for others to move forward. However, for the first time in many years, no U.S.-Russian nuclear arms control negotiations are under way. If the draft U.S. Nuclear Posture Review (NPR) is any guide to U.S. policy, there will be no U.S.-Russian nuclear arms control negotiations for the foreseeable future. Instead, we could see a return to a nuclear arms race. Russian officials consistently have asked to extend the New Strategic Arms Reduction Treaty (New START) for another five years, to 2026, including an early call from President Vladimir Putin to President Donald Trump. Extending that treaty is an easy, positive step to take, but it hasn't been done. The landmark Intermediate-Range Nuclear Forces (INF) Treaty is on the rocks. For four years, both sides have alleged violations, but Russia last year actually fielded a ground-launched cruise missile that violates the treaty. The United States has stated it will remain in compliance, but the NPR puts Russia on notice that the status quo is untenable. More broadly, the NPR describes the re-emergence of great-power competition and blames Russia for rebuffing U.S. overtures on follow-on negotiations for New START on tactical nuclear weapons. It elevates the reported Russian interest in limited nuclear weapons use to a strategic imperative and concludes that the only response is more U.S. nuclear weapons. Russia, for its part, has engaged in provocative and illegal behaviors thought to be part of Cold War history. The NPR declares that Russia has not only violated that INF Treaty, but also the Conventional Forces in Europe Treaty, the Budapest Memorandum, the Helsinki accords, presidential nuclear initiatives … the list goes on. In the words of the NPR, the Cold War is over, but its language on tailored deterrence for Russia is as harsh as any during the Cold War. With U.S.-Russian relations so strained, there is little room for progress anywhere else, which brings us to the Iran nuclear deal. Trump has been consistent in his dislike of the Joint Comprehensive Plan of Action, which puts additional constraints on Iran's capabilities to develop nuclear weapons. In October, Trump did not certify to Congress that Iran was in compliance, but Congress was unable to pass legislation that would provide an alternative approach. Earlier this month, Trump continued to waive sanctions, but called on the Europeans to craft a supplementary deal by May. Trump himself has never offered a single viable alternative. But, so far, he hasn't been willing to unilaterally pull out of the deal as he has threatened. Nonetheless, this is hardly a recipe for stability and predictability going forward. Other multilateral agreements are in trouble. The nuclear Nonproliferation Treaty turns 50 years old in 2020. Twenty-five years ago, in exchange for the indefinite extension of the treaty, the nuclear-weapon states promised to conclude a nuclear test ban, end the production of fissile material for weapons, reduce reliance on nuclear weapons, and in general, progress toward reducing the risks from nuclear weapons. Well, as you know, the Comprehensive Test Ban Treaty (CTBT) was signed 20 years ago, but it still hasn't entered into force. No longer does the United States promise not to test nuclear weapons until the CTBT enters into force, but instead the new NPR states that the United States will not resume nuclear testing unless necessary to ensure the safety and effectiveness of U.S. nuclear weapons. Finally, the 2020 review of the nuclear Nonproliferation Treaty will not be pretty, in spite of the conclusion last year of a treaty on the prohibition of nuclear weapons. The International Campaign to Abolish Nuclear Weapons won a Nobel Peace Prize for its efforts related to the ban treaty, and more than 50 states have signed it so far. Nuclear-weapon states, on the other hand, boycotted the negotiations and have rejected it. We need more than symbolic victories to achieve a safer, more secure future. We need to do more. Sharon Squassoni is a research professor at the Institute for International Science and Technology Policy in the Elliott School of International Affairs at The George Washington University and is a member of the Science and Security Board of the Bulletin of the Atomic Scientists. The following remarks, edited for space and style, were made at a January 25 news conference announcing the advance of the Bulletin’s Doomsday Clock by 30 seconds to two minutes to midnight, signifying the most dangerous situation since 1953 following the first U.S. test of a thermonuclear device. The Nuclear Posture Review marks significant change from the Obama years. The Trump administration’s Nuclear Posture Review (NPR) report, unveiled Feb. 2, puts deterrence of nuclear and non-nuclear strategic attacks at the top of the U.S. nuclear agenda and pivots away from a number of key Obama administration policy priorities and commitments that sought to lower reliance on nuclear weapons. The review, the fourth since the end of the Cold War, makes a case for what it presents as a more flexible, resilient, and adaptable U.S. nuclear posture to meet current and future challenges. But critics warn that the Trump administration is moving in ways that will be costly and potentially destabilizing. Most controversially, the review addresses the circumstances under which the United States would consider the first use of nuclear weapons to include cyberattacks on critical infrastructure and attacks on nuclear command, control, and communications capabilities; calls for the development of two sea-based, low-yield nuclear options that do not currently exist in the arsenal; and gives relatively short shrift to arms control and nonproliferation. Whether the NPR has the impact the administration intends is far from certain in light of questions in Congress about the need, effectiveness, and affordability of the strategy; opposition from rival powers Russia and China; and concerns about President Donald Trump’s intemperate and bellicose rhetoric on nuclear weapons. Since the end of the Cold War, each administration has conducted a comprehensive review of U.S. nuclear policy. These strategy documents outline the president’s views on the role of nuclear weapons in U.S. strategy, maintenance of and upgrades to nuclear forces, and the overall U.S. approach to nuclear arms control and nonproliferation. In a January 2017 executive order, Trump directed Defense Secretary Jim Mattis to produce a national defense strategy, an NPR, and a ballistic missile defense review. Mattis initiated the NPR in April 2017. (See ACT, May 2017.) A draft of the document was leaked to the Huffington Post on Jan. 11, nearly a month before the planned release date. The final draft largely mirrored the leaked version. The NPR report contains elements of continuity with long-standing U.S. nuclear policy, such as affirming the strategic triad of land- and sea-based missiles and bombers, continuing the moratorium on nuclear weapons testing, and stating that deterrence of nuclear attack is not the sole purpose for U.S. nuclear weapons. But several of the proposed changes in the review have sparked controversy. Critics fear that the changes reverse decades of efforts to reduce the role and number of nuclear weapons in U.S. policy, increase the risk of nuclear conflict, and add to the crushing financial burden to sustain and upgrade the arsenal in the coming decades. The NPR report acknowledges that the upgrade costs are “substantial,” but claims that they are affordable and, at their projected peak in the late 2020s, will consume no more than 6.4 percent of the Pentagon budget. This estimate does not include the additional costs that must be borne by the National Nuclear Security Administration (NNSA) to upgrade nuclear warheads and their supporting infrastructure. “[S]ince the end of the Cold War, we have let our nuclear capabilities atrophy under the false belief that the era of great power competition was over,” McCain added. As with Congress, the reception to the NPR report among allies has also been mixed. “Japan highly appreciates the latest NPR which clearly articulates the U.S. resolve to ensure the effectiveness of its deterrence and its commitment to providing extended deterrence to its allies including Japan,” said Japanese Foreign Minister Taro Kono in a Feb. 3 statement. The document does not explicitly define “significant non-nuclear strategic attacks,” but at various points says it could include chemical and biological weapons attacks, large-scale conventional aggression, and cyberattacks. The report references the role of nuclear weapons in deterring non-nuclear attacks more than 30 times. The 2010 NPR report, in contrast, described “a narrow range of contingencies” in which nuclear weapons may play a role in deterring a conventional, chemical, or biological weapons attack and called for reducing the role of nuclear weapons in deterring non-nuclear attacks. Cyberattacks or attacks on nuclear command, control, and communications capabilities were not cited as grounds for a nuclear response. The Trump administration argues that the new revised language on declaratory policy does not signal an expansion of the circumstances under which the president would consider nuclear first use but rather makes explicit threats that have always been implicit. But some analysts warn that the language of the NPR report could have the effect of lowering the bar for first use of nuclear weapons and that threatening such use in response to cyberattacks or attacks on U.S. command and control capabilities would lack credibility. The review “opens questions about whether the United States would consider using [nuclear] weapons more readily than it might have in the past or in response to attacks that are less than fully catastrophic,” Rebecca Hersman, a former Pentagon official now at the Center for Strategic and International Studies, wrote in a Feb. 6 commentary. These “supplements,” as the report describes them, include the near-term deployment of low-yield nuclear warheads on submarine-launched ballistic missiles (SLBMs) and, in the longer term, development of a new nuclear-armed sea-launched cruise missile (SLCM). Critics maintain that the report misconstrues Russian nuclear doctrine and that additional low-yield options are unnecessary. “Rather than lowering the threshold of nuclear use, the Russians are actively seeking to increase it,” wrote Kristin Ven Bruusgaard, a fellow at the Center for International Security and Cooperation at Stanford University, in a Feb. 13 article. Other analysts have noted that the United States already possesses two types of low-yield warheads for delivery by strategic bombers, making redundant the NPR report’s proposed third and fourth low-yield options. The Defense Department’s budget request for fiscal year 2019 released on Feb. 12 includes $22.6 million for developing a low-yield SLBM option. The request does not contain funding for a new SLCM. The NNSA budget request does not include additional funds to modify SLBM warheads or to begin development of a warhead for the SLCM. The NPR also seeks to retain the B83-1 gravity bomb, the only remaining megaton-class warhead in the U.S. stockpile. The decision reverses the Obama administration’s proposal that the warhead be retired once confidence in the under-development B61-12 gravity bomb is achieved. The plan to keep the B83-1 bomb is part of a larger proposed expansion of NNSA nuclear weapons work that the NPR report says would provide “capabilities needed to quickly produce new or additional weapons” beyond the estimated 4,000 warheads currently in the active U.S. nuclear stockpile. The administration requested $11.2 billion for the NNSA nuclear weapons account in fiscal year 2019, an increase of $780 million over last year’s request and $1.8 billion over the fiscal year 2017 appropriation. In addition, the report says, without offering a reason, that the administration will not pursue ratification of the Comprehensive Test Ban Treaty (CTBT). The Trump administration's Nuclear Posture Review is the fourth since the end of the Cold War. It differs from the Obama administration's 2010 review in some key areas. Next steps will focus attention on the uncertain diplomatic skills of the Trump administration. North Korea’s participation in the 2018 Winter Olympic Games eased tensions on the Korean peninsula and opened space for potential dialogue between Pyongyang and Washington. But that opportunity may not last as the United States plans to resume military exercises with South Korea and North Korea threatens to resume it nuclear and ballistic missile testing activities. Moon has sought to build on the fledgling North-South dialogue to bring about U.S.-North Korean talks to reduce the risk of war over Pyongyang’s advancing nuclear weapons program. His efforts, however, may not be fully supported by the Trump administration. “We want to talk only under the right conditions,” President Donald Trump said Feb. 26. The developments will focus attention on the uncertain diplomatic skills of the new U.S. administration. It hasn’t filled the key U.S. ambassador post in Seoul and just lost a key State Department official, Joseph Yun, who retired March 2 as special representative for North Korea policy. The public diplomatic exchanges over potential talks followed the collapse of secret plans for U.S. Vice President Mike Pence to meet with senior North Korean officials Feb. 10 during the Olympics’ opening days. U.S. officials said the North Koreans backed out, although North Korean officials said publicly on Feb. 7 that there was “no intention” of meeting with U.S. officials during the games. That breakdown came as North Korean leader Kim Jong Un, through sister Kim Yo Jong, invited Moon to come to Pyongyang for talks. The North Korean delegation was in South Korea for the Feb. 9 Olympics opening ceremony. The Trump administration has taken a wary view toward the favorable attention focused on North and South Korea’s joint participation in the Olympics, saying Pyongyang continues to press ahead with a nuclear weapons program that will soon put all of the U.S. mainland at risk. U.S. officials say time is running out before the United States may take military action. Kim’s moves threaten to open a rift between South Korea and the United States, particularly if the U.S. administration is seen as hindering outreach efforts by Moon, who seeks to continue the inter-Korean dialogue that began in January. En route to South Korea, Pence told reporters he would urge Moon to return to a policy of maximum pressure and “diplomatic isolation” toward the Pyongyang regime once the games ended. U.S. officials on Feb. 21 confirmed a report in The Washington Post that Kim Yo Jong and Kim Yong Nam, North Korea’s nominal head of state, pulled out of the scheduled meeting at the last minute. Trump had approved plans for the meeting, at which Pence was to reiterate Washington’s demands and threats of further punitive actions, the article said. Pence said in an Feb. 11 interview, just after the then-secret meeting plan failed, that the United States is willing to engage diplomatically if North Korea wants to talk. U.S. Secretary of State Rex Tillerson, in a Feb. 18 interview with CBS News’ “60 Minutes,” said he “does not know precisely” how much time is left, although “diplomatic efforts will continue until that first bomb drops.” Mixed messages and failure to provide clarity about the diplomatic approach have complicated his efforts. Trump previously tweeted doubts about the likelihood of a diplomatic resolution. Last August, U.S. National Security Adviser H.R. McMaster said a so-called limited preventive strike was on the table as an option. While other officials have since downplayed or denied a “bloody nose” scenario is being considered, Victor Cha, whose anticipated nomination to become U.S. ambassador to South Korea was abruptly dropped by the White House, said he had warned administration officials against any such plan. “The answer is not, as some Trump administration officials have suggested, a preventive military strike,” Cha wrote on Jan. 30 in The Washington Post. He warned that such action could lead to an escalation that, in addition to Koreans, “would likely kill tens, if not hundreds, of thousands of Americans” in South Korea and Japan. The United States is planning to resume U.S.-South Korean military exercises, delayed for the Olympics and the subsequent Winter Paralympic Games on March 9-18. U.S. officials said on Feb. 20 that there would be no changes to the original size and scope of the drills. Pyongyang has long viewed the joint exercises, particularly the so-called decapitation drills, which simulate strikes on North Korea’s leadership, as provocative. China and Russia called for the United States and South Korea to suspend the joint military exercises in exchange for a nuclear and missile testing moratorium from North Korea, an offer which Pyongyang made to the Obama administration in 2015. (See ACT, January/February 2015.) McMaster has rejected this “freeze for freeze” proposal. Although North Korea has refrained from missile testing since December, Pyongyang did hold a parade Feb. 9 that displayed its intercontinental ballistic missiles and a new short-range ballistic missile. A false missile attack alert in Hawaii was caused by human error when a Hawaii Emergency Management Agency (HI-EMA) employee thought an exercise was a real attack, officials said. The agency employee mistakenly sent out an emergency alert Jan. 13 warning of an incoming ballistic missile and directing residents to take shelter. Despite quickly discovering the mistake, it took the agency 38 minutes to notify the public, which is longer than the flight time for a North Korean missile to reach the Hawaiian Islands. Gov. David Y. Ige (D) called the mistake “totally unacceptable” and apologized for the “pain and confusion” caused by the false alert. The unidentified employee reportedly was fired. Sanctions implementation remains a problem, according to a UN panel of experts. The United States continues to ratchet up pressure on North Korea to end its nuclear weapons and missile development, with Washington imposing additional sanctions and calling for better implementation of UN sanctions. A U.S. Treasury Department news release Jan. 24 stated that nine entities, 16 individuals, and six ships were added to the sanctions list as part of U.S. efforts to “systematically target individuals and entities financing the [Kim Jong Un] regime and its weapons programs.” The effort is to target “illicit actors in China, Russia, and elsewhere” for working on behalf of North Korean financial networks and for entities that “continue to provide a lifeline to North Korea” in violation of UN Security Council resolutions, said Treasury Secretary Steven Mnuchin. Earlier in the month, U.S. Secretary of State Rex Tillerson called on all states to improve sanctions implementation during a meeting of 20 countries in Vancouver. The countries represented were the 18 that supported South Korea during the Korean War by sending troops under UN command, plus South Korea and Japan. Sanctions implementation remains a problem, according to a leaked report from a UN panel of experts that assesses implementation of Security Council measures on North Korea. The experts report, obtained by the Associated Press in early February, said that North Korea is using “deceptive practices” to circumvent financial sanctions and noted that there are “critical deficiencies” in sanctions implementation. The report concluded that Pyongyang is engaging in prohibited ballistic missile activities with Syria and Myanmar and exceeding caps on oil imports, including through illegal ship-to-ship transfers. Tillerson, at the Vancouver meeting, specifically called for improving maritime interdiction activities and putting an end to ship-to-ship transfers. The report found that North Korea evaded UN sanctions on coal by shipping it through other countries and using deceptive practices to hide the origin of the coal. Coal purchases were fully banned by Security Council Resolution 2371 in August 2017. The UN report also noted that China imported iron ore from North Korea in violation of sanctions. Leaders at the Vancouver meeting emphasized the importance of full implementation of UN sanctions, but they appeared split on how to engage with North Korea diplomatically. South Korean Foreign Minister Kang Kyung-wha said “tough sanctions and pressure” and “the offer of a different, brighter future” must work hand in hand. Japanese Foreign Minister Taro Kono said that North Korea’s decision to engage in inter-Korean dialogue was proof that the sanctions regime is working. Kono said that it would be “naïve” to reward North Korea for engaging in inter-Korean dialogue and that now is the time to “fully and rigorously” implement UN measures. He also called for states to consider additional measures, such as cutting diplomatic ties with North Korea and repatriating North Korean workers.